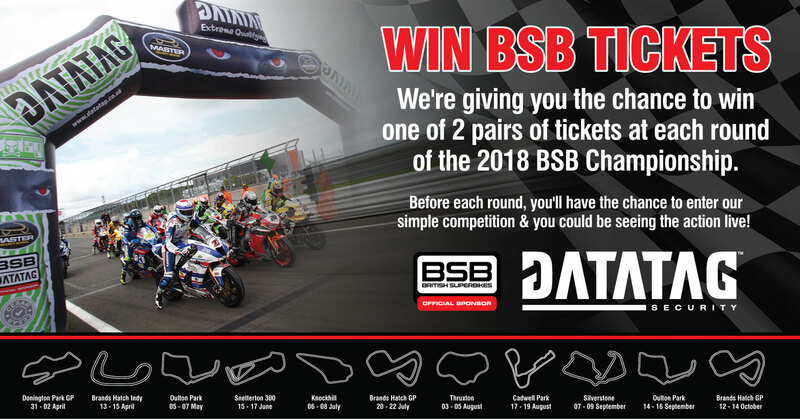 We're giving you the chance to win one of 2 pairs of tickets at each round of the 2018 Bennetts British Superbike Championship. Before each round, you'll have the chance to enter our simple competition and you could be seeing the action live! After each round we'll announce the lucky winners and let you know when you can enter again for the next round. Make sure you've liked and followed our Facebook page to find out if you've won! Even better - if you get our poll question right, we'll enter you into a special draw to win VIP hospitality tickets to the last round at Brands Hatch in October. To enter, entrants will need to complete the Datatag Extreme Qualifying Survey via the link on the Datatag ID Facebook page. The closing date for completing the survey for each rounds prize draw is 12:00am on the Wednesday prior to each round. Entries received after this time will not be accepted. 2 winners per round will be chosen by computer random number generator with the exception of round 11, where no tickets are available, and the final, where a single pair of tickets is available. Each winner will receive a pair of general access tickets to the following weekends round. No alternative will be offered. The winner will be notified by email (using details provided at entry). If a winner does not respond to the Promoter within 24hours of being notified by the Promoter, then the winner's prize may be forfeited. The Promoter reserves the right to select another winner in accordance with the process described above. The prize will be sent to the winner by post within 2 days of being notified of their win. The prize is supplied by Datatag who reserves the right to replace the prize with an alternative of equal or higher value if circumstances beyond their control make it necessary to do so. The winner's name and county can be obtained by sending a message to Datatag on social media (Facebook or Twitter) within 30 of days after the date of the closing date of the prize draw. The Promoter of this prize draw is Datatag ID Ltd Marine House, Thorpe Lea Road, EGHAM, Surrey TW20 8BF.